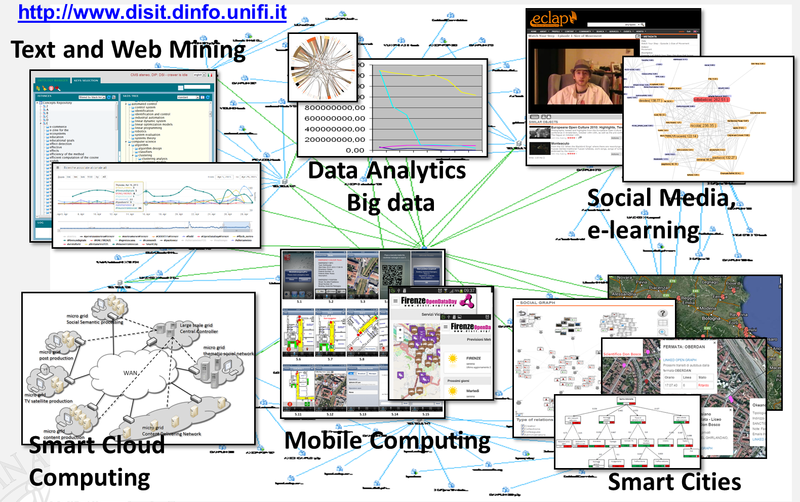 DISIT lab è un ambiente estremamente attivo in Big Data, Data Analytics, smart city, IOT/IOE, etc. dove i contrattisti e gli assegnisti di ricerca si dovranno confrontare con progetti abiziosi di livello internazionale come: https://www.snap4city.org, REPLICATE H2020 https://replicate-project.eu/, https://www.km4city.org , TRAFAIR CEF, RESOLUTE H2020, Http://www.sii-mobility.org, MOSAIC RT, FEEDBACK RT, Collabora MIUR, LIFE WEEE, SmartBED, 5G etc. Questi progetti sono in collaborazione con molte aziende nazionali ed internazionali quali: Leonardo, ALSTOM, TIM, ENEL, ESTRA, WIND, VAR Group, ECM, TIME, etc. Visit the new IOT Smart City Platform of DISIT Lab: Snap4City solution which is fully open source, support cloud and scalability for processing and IOT/IOE, respect user needs and privacy according GDPR and to the different user kinds, provide tools and community for co-creation; mixt data driven, stream and batch processing; it is fully based on microservices and using easily replaceable tools. 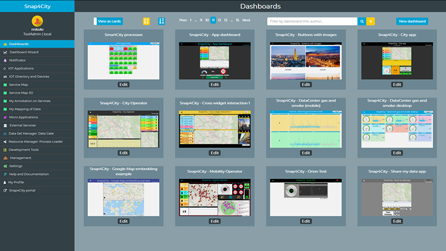 Snap4City solution has been designed to be Click to access Snap4City tools main entry Click the image to access Snap4City scalable, flexible, safe and respectful of privacy, endowed of a powerful semantic reasoner based on Km4City multi-domain semantic model and tools (https://www.km4city.org). A special attention is provided to enable the development of applications in multiple domains and not only on mobility and transport, tourism, health, welfare, social, etc. DISIT lab and research group is active since 1994. It is one of the most active ICT labs of the University of Florence, metropolitan Tuscany area. DISIT successfully developed a relevant number of International and National research, development and innovation projects. DISIT provides an infrastructure for cloud and distributed computing. DISIT has coordinated a number of large EC projects, in many others has covered the role of partner, and also coordinating scientific and technical WP and performing activities of dissemination and assessment. DISIT has received a relevant number of awards and is directly involved into top level international conferences, advisory boards, and committees. Content and data protection: IPR modeling, conditional access, digital rights management, MPEG-21 (http://www.axmedis.org), http://www.disit.org/5509, protected content players, etc. DISIT solutions for: user behaviour analysis, multilingual and cross media indexing, user and collective profiling, indoor/outdoor navigation, media synchronisation, matchmaking, audio transcoding, sentient and autonomous agents and tools, open data, linked open data. DISIT commitment for the next European Commission Calls are reported below, while major information can be easily recovered by performing a query above, by searching on the web page, projects, documents, papers, deliverables and slides available and indexed on the DISIT Lab web site. The reported links are only to show examples. see for example projects and tools such as: sii-mobility, Collabora, Mobile Emergency, ... Social Museum and Smart Tourism. applications on: mobile, spart TV, tables, etc. natural language processing algorithms and tools: profile processing, comments understanding, affective analysis, social media analysis. recording experiences: navigation, collaboration, etc. collaborative work models and tools: mobile, smart TV, etc.